Wishing you all a Merry Christmas! Thanks so much for all your support and encouragement this year. It's been my great pleasure to share my work with you. I'm looking forward to a great 2014! I have a children's picture book coming out soon. I'll update you when I have a release date. And, of course, there will be more cards! 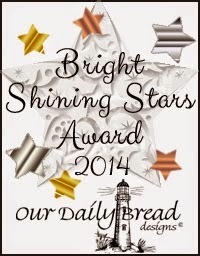 I am also hoping to have some very talented, fellow crafters do a bit of guest posting here. Can't wait for you to see some of their work. May I pray with you today? 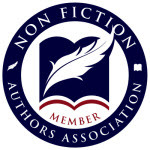 Our dear Heavenly Father, I thank You for each person who has visited my blog this year. I seek Your blessings on each one. Grant them peace and love and lots of laughter as we celebrate the birth of the Messiah. I know some who come here find themselves far away from family and other loved ones. May they and their loved ones never be far from You. In the blessed name of Jesus, Amen. My husband, Jeff, and I celebrated our 35th wedding anniversary last week. Hard to believe that much time has passed since we found each other. I wanted to share a card I made to mark the day and add to a scrapbook page. 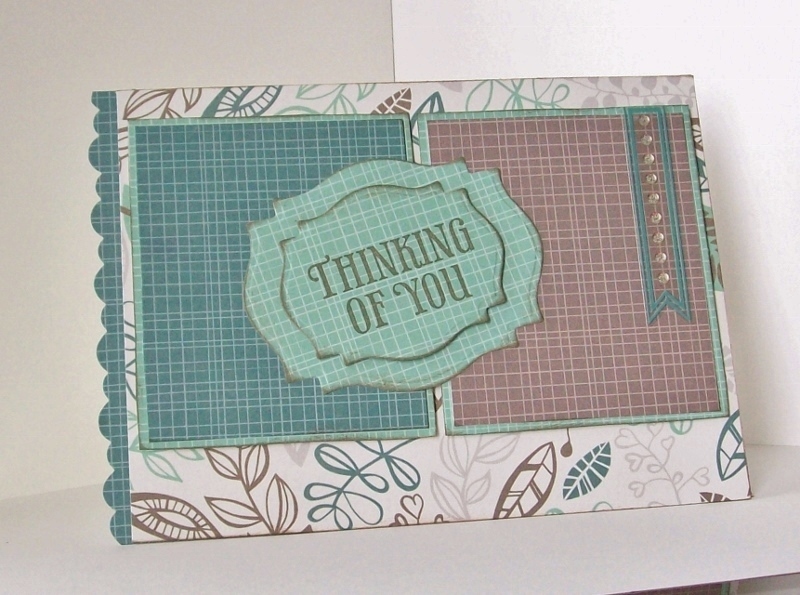 All the cardstock I used here comes from DCWV's The Summer Solstice Stack. Thanks for popping in and sharing our day! Thanks for popping in today. Hope you are enjoying your winter. Mine has been really busy, but not too busy for another Stack-a-holic challenge from DCWV. 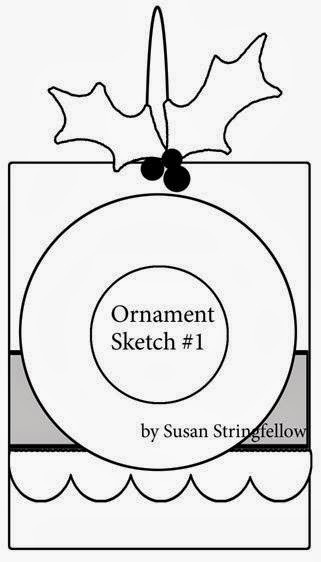 Instead of a card challenge this month, we have an ornament challenge, or a gift-tag if we prefer. This is my year for gift-tags, I guess. I've had several challenges asking for gift-tags recently. 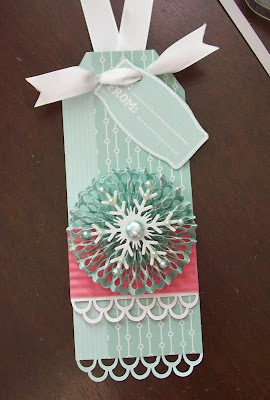 I made this tag as a Christmas tag, but I could easily use it for a number of occasions. Here's how I made this one. I cut a light minty-green tag shape (2.5" x 7") from DCWV's Homespun Cardstock Stack - my absolute favorite stack of all time. 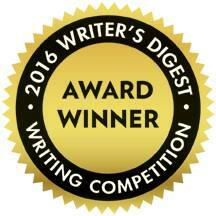 All other paper for this tag comes from DCWV's Handy-Dandy Stack. I punched a double-loop edge (Martha Stewart) on the bottom end of the tag. I cut a smaller panel from a coordinating patterned paper and adhered it along the side. I ran a small strip of light red/dark rosy patterned paper through my crimper (Fiskars) and matted it with a white panel that was also trimmed with the double loops. To make my medallion, I punched a 12" length of a lattice chain edge (EK Success) from the same paper as the side panel. I scored it every 1/2" and fan-folded it into a medallion. It is so pretty and lacey in person. I adhered the snowflake brad (the Paper Studio) with hot-glue in the center. 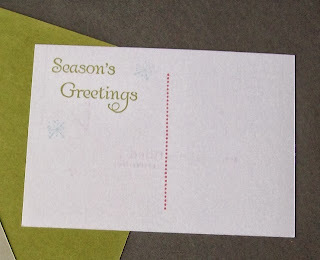 I heat-embossed the to-from tag (Fiskars) in white ink and white embossing powder on the back of a scrap left over from the minty green tag. Then, I punched two holes and laced a length of white, satin ribbon between them. I also added a ribbon to the back so I can tie the tag to a present. Thanks for stopping by today. Always love your visits. I'm playing along this week in Core'dinations ColorCore Cardstock online crop and getting a head start on my Christmas cards. 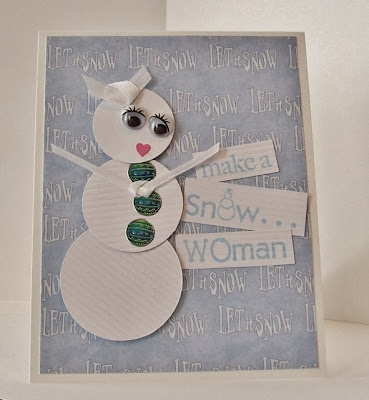 The challenge here was to make a card using handmade elements. I made my Christmas tree with two sizes of heart punches (Fiskars). I used two shades of olive and dark rosy red from Core'dinations Nostalgia collection. 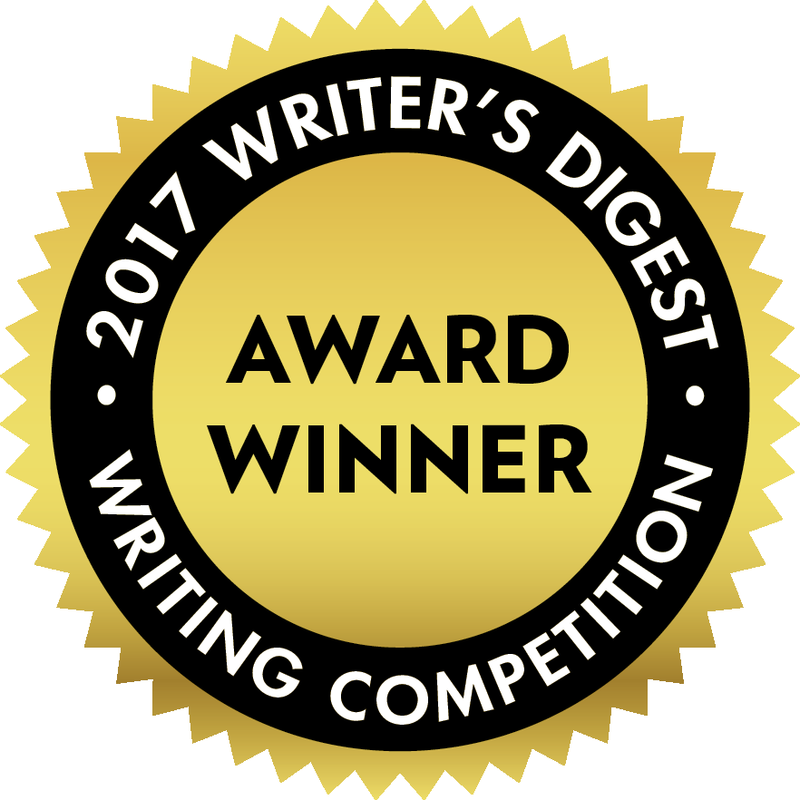 First, with the lighter olive, I embossed - well actually I debossed because I got the paper against the plate (Spellbinders) upside down. But, I liked it so I went with it. I sanded the cardstock and punched four large and one small heart, turned them so the pointy end was up, and glued them together to make a tree. I decorated with pearls and a star which began life as a flower. I adhered the tree with foam tape to the rosy red panel. I cut a same-size panel of darker olive and embossed it with a folder (Sizzix) and fussy-cut the center out. I added thicker foam tape to adhere the top panel. I'm playing along this weekend in Core'dinations ColorCore Cardstock online crop and getting a head start on my Christmas cards. Those who know me would tell you that I almost always use non-traditional colors for my Christmas cards - like this purple, blue and white card. 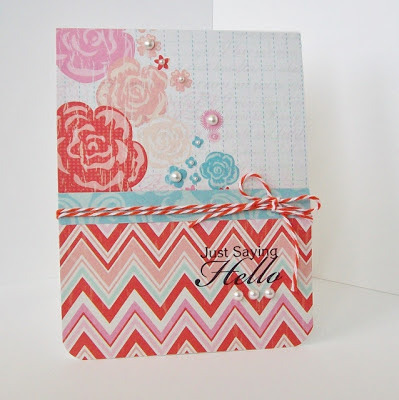 The object of this challenge is to create a clean-and-simple card with a sentiment and two or less embellishments. As you see, I only used one which I call a snowstar. To get the snowflake brad (the Paper Studio) to shine, I laid it on the back side of a 5 x 7" grape panel from Core'dinations' Nostalgia collection. I marked the arms of the snowflake and then scored from the back along those lines. I did a little sanding and my snowflake, I mean snowstar, shines! 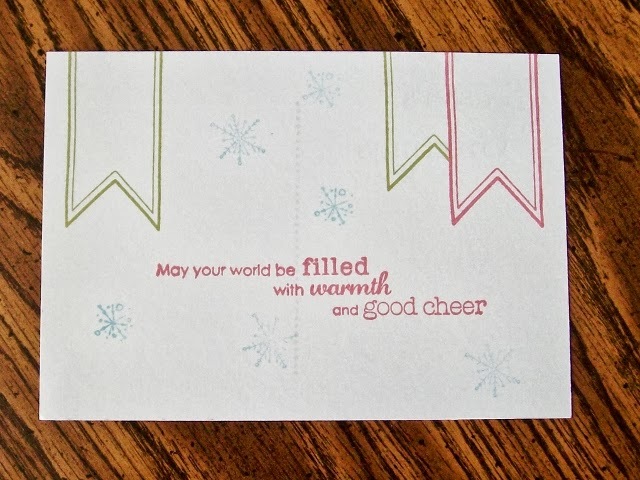 I heat-embossed the sentiment (Fiskars) with white pigment and white embossing powder. I lightly sanded the edges of the tag to make it stand out against the same color background. To finish, I adhered the panel to a white card base. I'm playing along this weekend in Core'dinations ColorCore Cardstock online crop and getting a head start on my Christmas tags. The object of this challenge was to create at least two tags and to stamp on the tags. 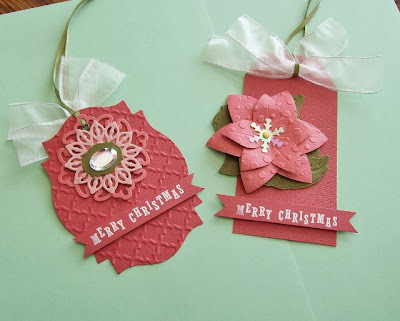 I used an olive green and three shades of rosy red from Core'dinations Nostalgia collection to make my tags. 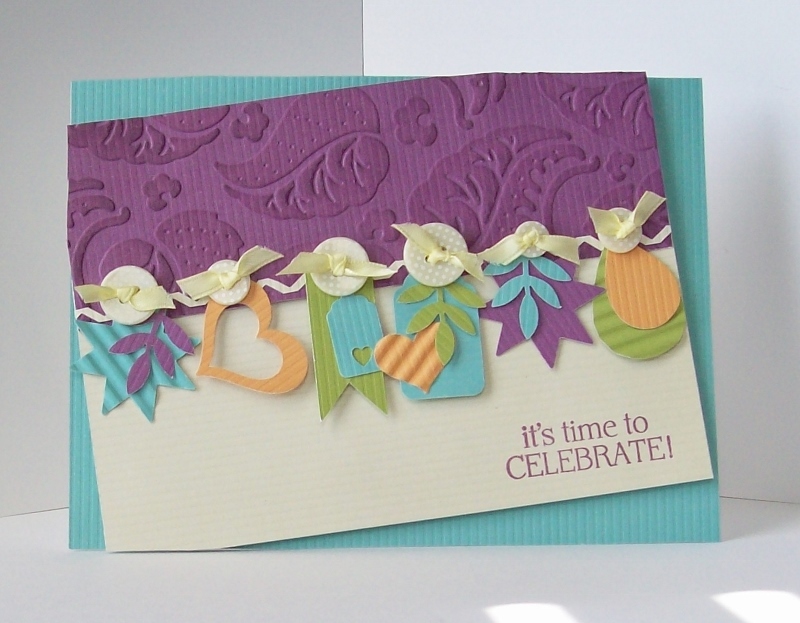 I used embossing folders(the Paper Studio) to create the quatrefoil and dotted textures. 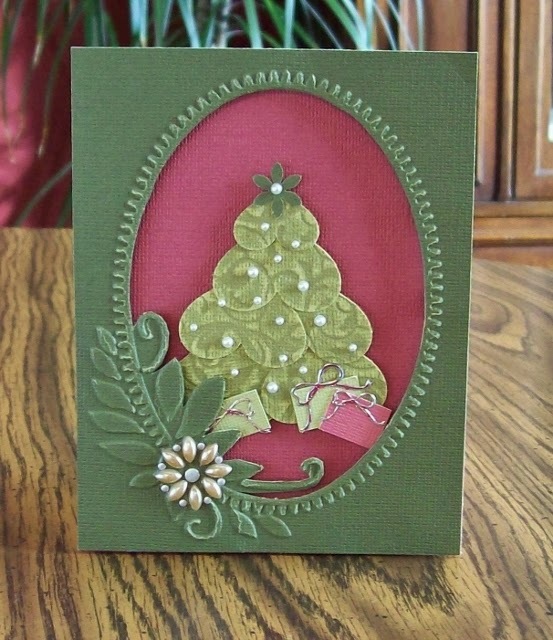 I used a combination of dies(Spellbinders) and punches (Fiskars) to make the embellishments. I heat-embossed the sentiment (Cosmo Cricket) with white pigment and white embossing powder. Added a giant diamond (real, of course) and some ribbons. Two tags down and lots more to go. If you popped in today expecting to see a card, you might get one later today. But first, I owe you all a big thanks! 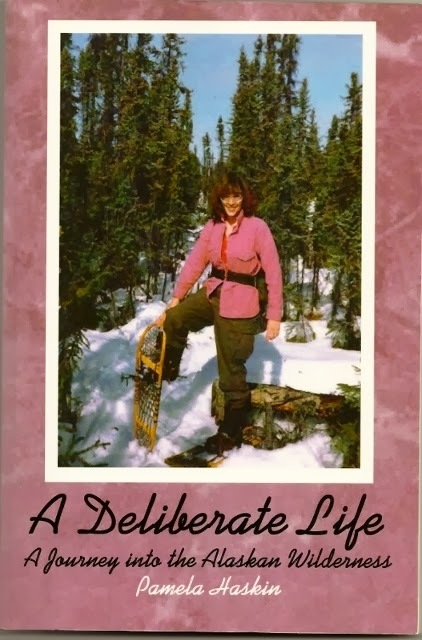 You guys are buying so many e-book copies of my book, A Deliberate Life: A Journey into the Alaskan Wilderness, that you have brought new life to it. And, the price is super - less than $4 at bn.com and amazon.com. I know you have been buying copies since it was first published, but once my publisher made it an e-book, sales have really taken off again. Thank you so much to each one of you. 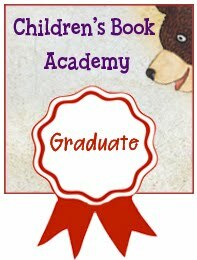 I'm currently working on the illustrations for a children's picture book I wrote. It will be out before long. I'll keep you posted about the release date and other info. You guys really are the greatest! There is a fun online crop going on at Core'dinations ColorCore Cardstock this weekend. And, we have until Nov 10th to get our projects in. Yay! I love having extra time. Thanks, Core'! Thanks so much for popping in today. Always so nice to hear from you all. My card today is for DCWV's August Card Sketch Challenge. 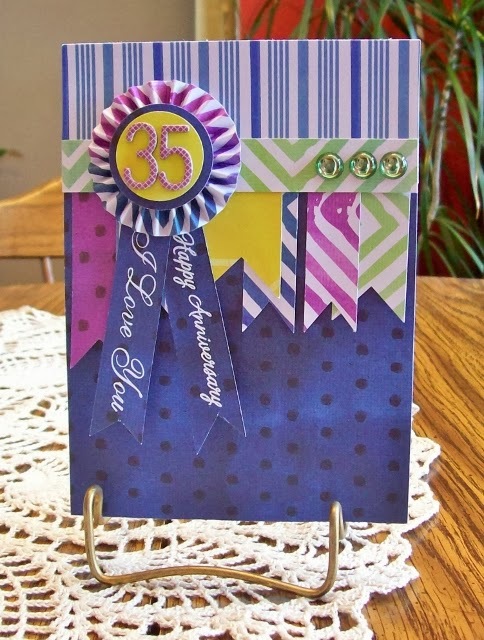 I used The Home Spun Cardstock Stack for this card. I'm really excited about how the top purple panel turned out. To begin with, some of the cardstock in this stack has a scored texture. 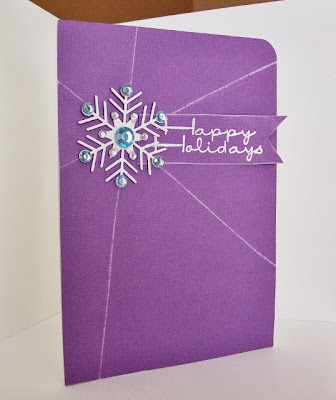 I embossed the pre-scored purple panel using Spellbinders M-bossabilities folder EL-009. 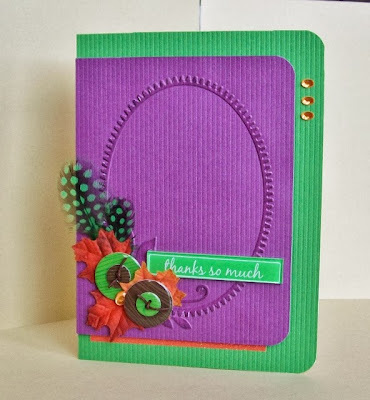 Then I ran a pigment pad (ColorBox -boysenberry) across the top of the embossed panel. In person it looks just like hand-tooled leather! Then, for the fun part. I gathered up a bunch of my punches and started punching and stacking. I used a Hero Arts stamp (CL342) for the sentiment. I made a card last week with an offset top panel and got so many comments about it, I wanted to use that technique again. Don't you think it adds a lot interest to the card? I love the polka-dot buttons too (Studio G ). Hard to believe that July is almost gone! Time to get another DCWV challenge card submitted before time runs out. There's still enough time if you want to join in on the fun. I'll put the link and the sketch below. 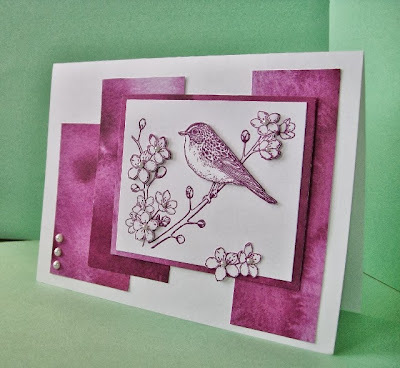 I used DCWV’s Chickadee Mésange Pájaro stack for this card. I say this card would work equally well for a woman or a man. I often need a masculine card - lots of men in my family. I will be sending this card to one of them. 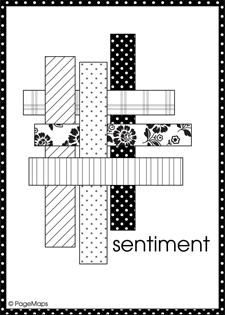 I used Spellbinders Labels Eighteen dies for my sentiment tags. I brushed the edges with brown ink to make them stand out. 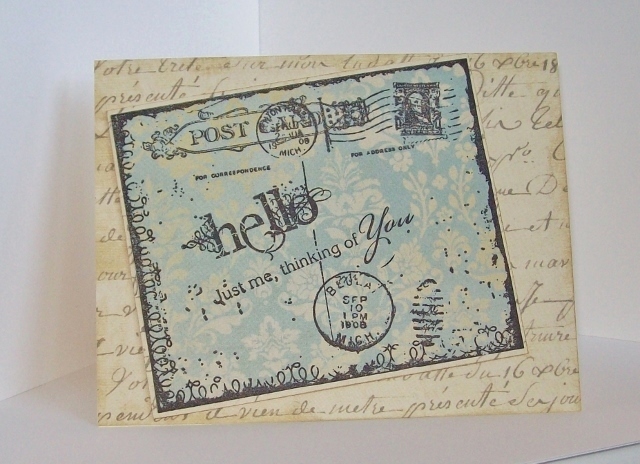 The sentiment is from Hero Arts and is stamped with the same brown ink. 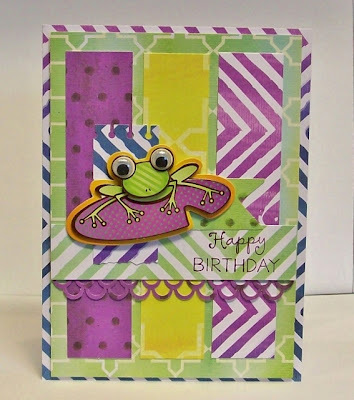 I created this card for the Tuesday Trigger- A Painterly Palette challenge in the Moxie Fab World. Using the heat-resist technique to make the circles, I stamped different doily images with Versamark watermark ink and then heat-embossed with white embossing powder onto white cardstock. Then I rubbed pigment ink pads over the top of the heat-resist doilies. 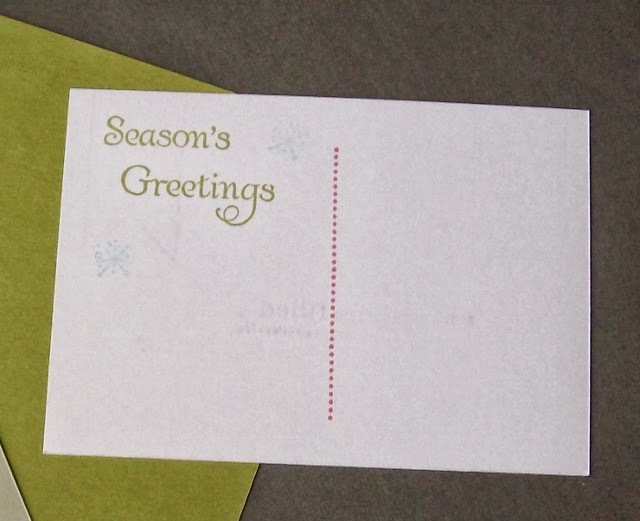 I gently rubbed the ink off the embossing leaving behind my white embossing lines. I only used three colors of ink but applied more or less ink to some of the circles to create different shades. 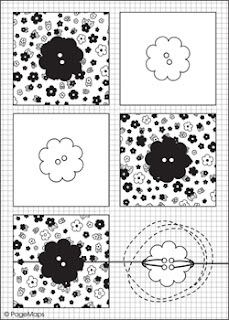 Next, I punched 1.25" and 1.50" centers from the doilies. Adhering a few circles with foam tape, I used the darker doilies at the bottom and the smaller circles in the back to give depth and movement to the card. 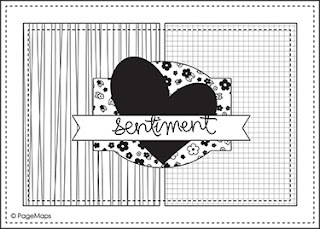 I also used heat-resist on the sentiment tag. 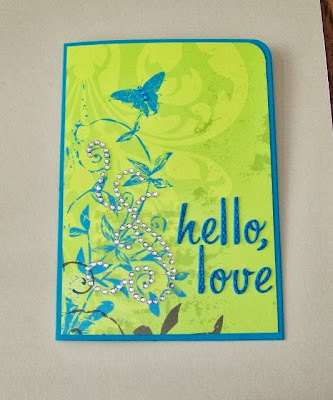 I stamped on white cardstock here as well. 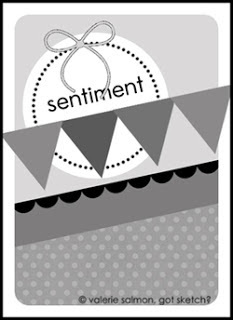 Then, I applied the ink, trimmed and matted the sentiment tag with white cardstock. That gorgeous background cardstock comes from the Chickadee Mesange Pajaro stack from DCWV. Thanks so much for stopping by this weekend. Hope you are all getting a long weekend and spending time with family and friends. 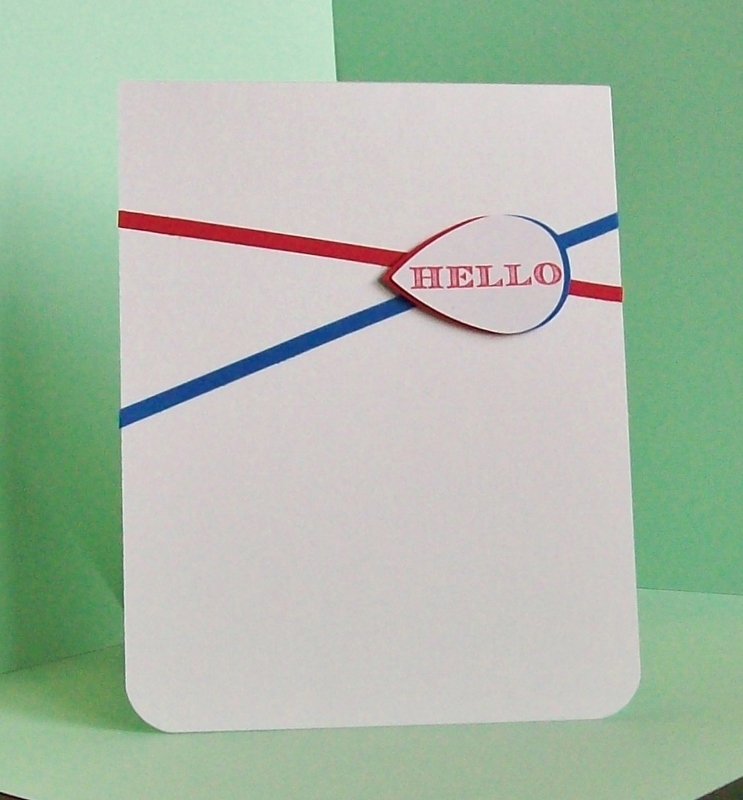 In honor of Memorial Day, CAS-ual Fridays issued a challenge for a card using red, white & blue. Beginning with a white card-base (4.25x5.5), I trimmed 1/8" red and blue strips from cardstock. Then, I stamped 'Hello' in red and punched the petal shape using Fiskars extra large Petal by Petal punch. I also punched a petal in red and another in blue. As you can see, I glued them together with just a sliver of each color showing from behind the sentiment. 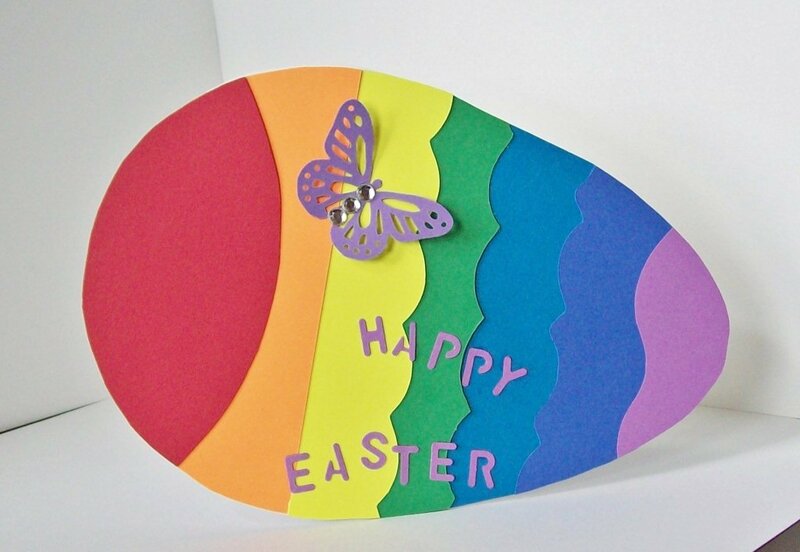 I adhered the finished petal with foam tape and rounded the bottom corners of the card. I have one more card to share today. I created it for this week's CAS-ual Fridays Challenge, and what a fun challenge it is - stamping on designer paper! I really had to think about this card in a different way. I almost always stamp on plain colored paper/cardstock. As I went through my stamps, I had to imagine each one on the printed paper I picked out from DCWV Heirloom stack. The background is a sheet from the Paper Studio's Rue de Fleur collection. I inked the edges with distressing ink to give it more the feel of the old postcard stamp. I stamped the postcard image in black ink using Tim Holtz' Travel Collage collection. 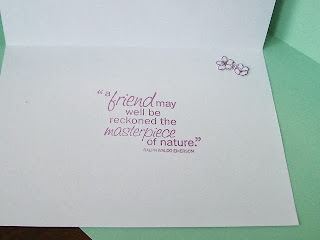 Then, I picked a sentiment from two different TPC Studio collections (Card Crafting Hello and Girlfriends). This was a fun card to make and I think you could send it to both male and female friends. OOoooo, feathers! I hope this trend never goes away. 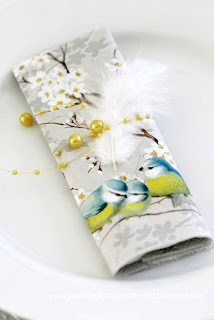 As soon as I saw the latest Tuesday Trigger inspiration, I knew I had to use my marabou feathers on a card in some way. 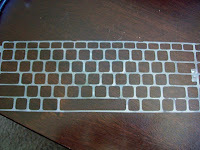 Here's my take on the challenge and a note about upcycled packaging. 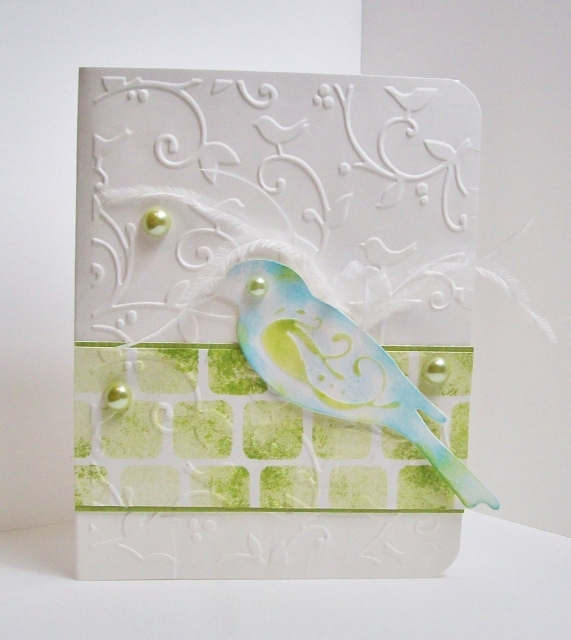 First, I made the card base with white cardstock embossing it with Cuttlebug's Birds and Swirls folder. Then, I die cut the bird using Spellbinders' Bird Sanctuary dies. 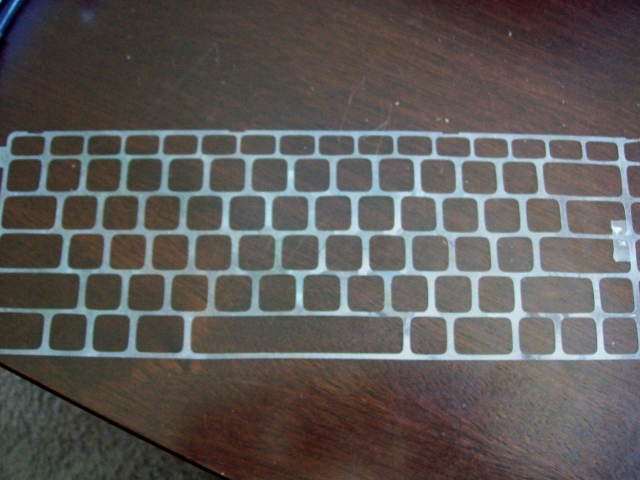 I bought a new laptop a while back, and when I pulled the protective cover off the keyboard, I knew I had to upcycle the cover in some way. I used it here as a stencil to make my own patterned paper. After daubing on some color, I trimmed the panel and matted it with matching cardstock. The stencil covers half a sheet of cardstock so I have more panels to play with. Wooohooo! 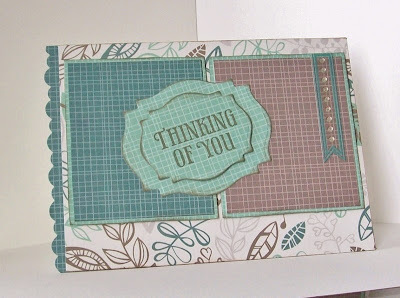 I have a card for you today that I created for DCWV's May Stack-a-holic Template Challenge. I'm loving the deep, vivid colors in The Solstice Stack from DCWV. The flowers on the left panel and the bottom flag come pre-glittered. Gotta love that! There is still plenty of time left if you want to play along with us. Here's this month's sketch and the address with all the details. Thanks so much for stopping in today! UPDATE: Just found out this card was selected for DCWV's TOP 10! Wooohoooo! Thanks for popping in for a little visit. Today, I have a card for DCWV's Card Sketch Challenge for April. Don't you just love these colors!?! I used The Solstice Stack from DCWV to make this birthday card. The colors and textures are fabulous in this stack! This is definitely one of my favorite stacks. Recently, I found a box full of papers and stickers at a garage sale, and this frog was in in the box. I just love him! The packaging was gone so I don't know who made him. Do you know? Please let me know if you do. I would like to have more of him. There's still plenty of time left if you want to play along with us. Here's the sketch we had to work with and the address to get all the details. Thanks so much for stopping by. I love your visits and comments. Hope you have a wonderful day! 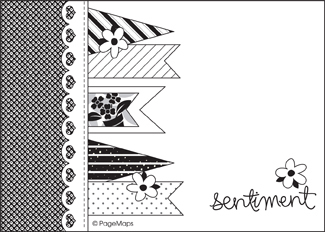 Did you know that Paper Smooches has free digitals!?! 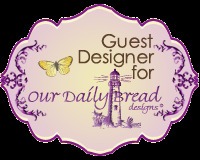 They do and they are looking for their Guest Designer for May. I used the Flower Cluster digi and one of the Thanks digis. I printed several flower clusters onto purple cardstock, did a little fussy-cutting and a bit of arranging. 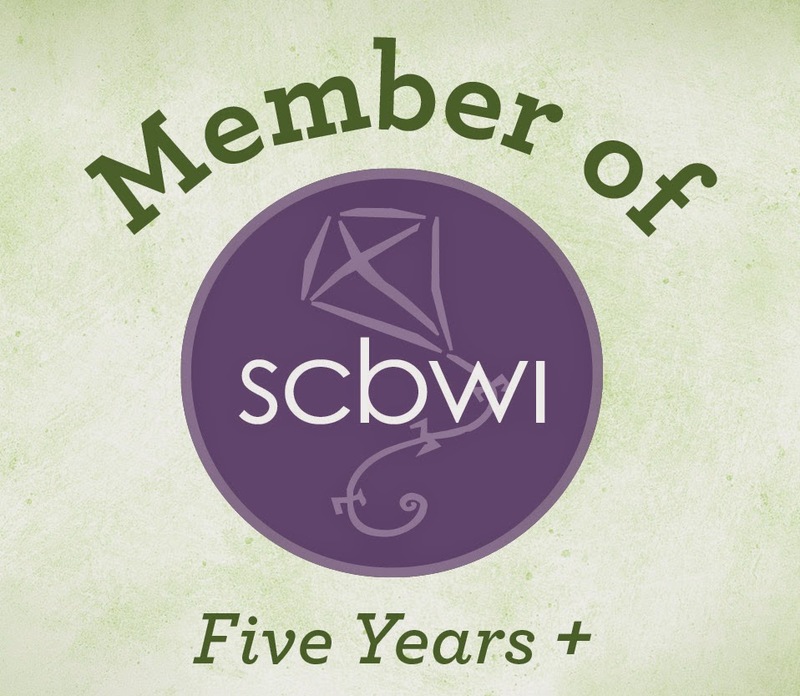 I added a few gems that match the blue trim on the banner and rounded a corner. Time for another Card Sketch Challenge at DCWV. 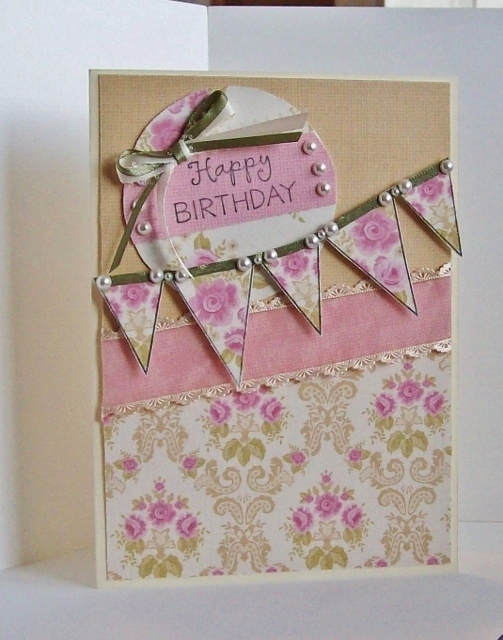 I created this card using DCWV's The Pink Fabric Stack. I had never worked with their self-adhesive fabric sheets before and wasn't sure I would like it. But, I did and I learned few things about working with the fabric sheets. ~ Don't stretch the fabric when you pull the backing off. Work slowly and gently and it will work perfectly. ~ You can stamp on the fabric using simple stamps. I found if the stamp was too detailed it did not give a clear image. ~ Use dye ink - pigment and alcohol inks tend to bleed and spread. What looks like pink lace across the middle of my card is really a sheer beige. When I put it on top of the solid, pink fabric strip it took on the color beneath. I really liked the affect, so I left it. The pink under the lace is the same pink as the birthday tag. For the flags, I adhered a bit of the fabric to white cardstock and stamped the flag outlines. Then, I cut them out and adhered the flags to the card with foam tape. I added a green ribbon to match the leaves and a few pearls. So happy to have given this Pink Fabric Stack a chance. I would certainly use it again and buy more fabric stacks. And, here's a copy of the sketch we had to work with. 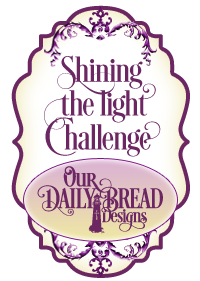 Cath has some great challenges over in the Moxie Fab World this month. 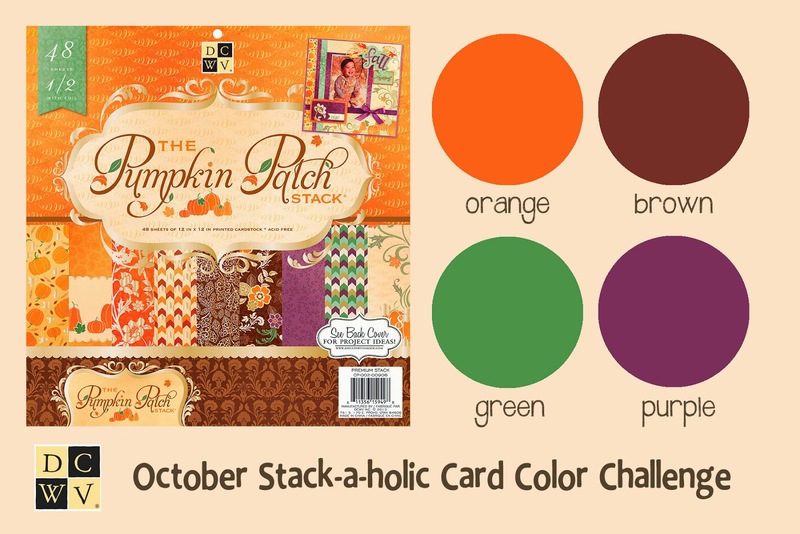 I created this card for the Ombre Challenge. I made the ombre border using Fiskars' new pinwheel punch. The rebel in me is always looking to use my punches for purposes other than those for which they were intended. Using a variety of shades of purple cardstock, I overlapped and interlocked the flat pinwheels. Once I had them together, I ran the strip through my Xyron sticker maker and adhered them to my card. 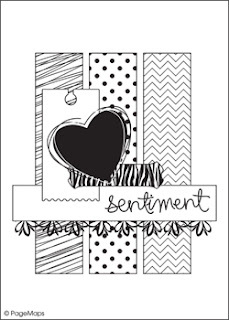 The sentiment is from Fiskars Friends Forever Quotes collection. I used ColorBox's chalk in Wisteria which matched my lightest purple exactly. I have another border to show you that I make with this same punch. I'll get that card up one day soon. Thanks for stopping back in. This is the last card for today. Well, I think it is. One never knows when inspiration will strike. I created this card for CAS-ual Fridays CFC94 Chipboard Challenge as well as the Thought Bubble Challenge in the Moxie Fab World. I've been playing around with my new pinwheel punch from Fiskars. 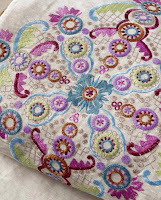 I punched several turquoise and purple pinwheels and overlapped and seated them together to make my border trim. I have another way I do this too that looks different, but you'll have to wait for the next challenge. 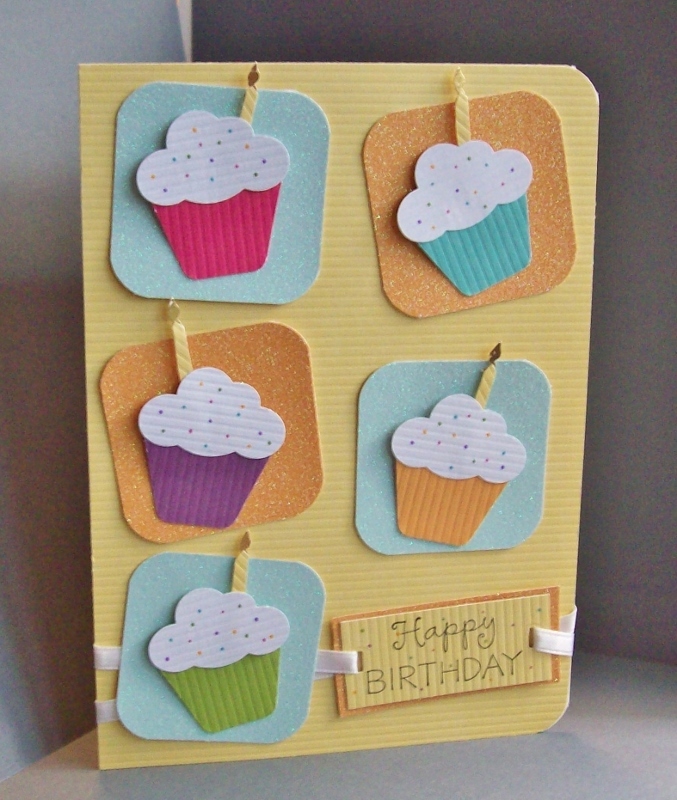 I did not have a chipboard to fit this card so I made one by using some thin cardboard. I heat-embossed the thought-buble tag with the fun HI from Studio G.
Cath, the leader of all things moxie in the Moxie Fab World, challenged us to create a paper project using chevrons. Who doesn't love chevrons!?! These fun chevrons (as well as the other two cardstock sheets) are part of the Lucky in Love collection from My Mind's Eye. The sentiment is part the Card Crafting Hello collection from TPC Studio. I added a few pearls and matching bakers twine to finish up. 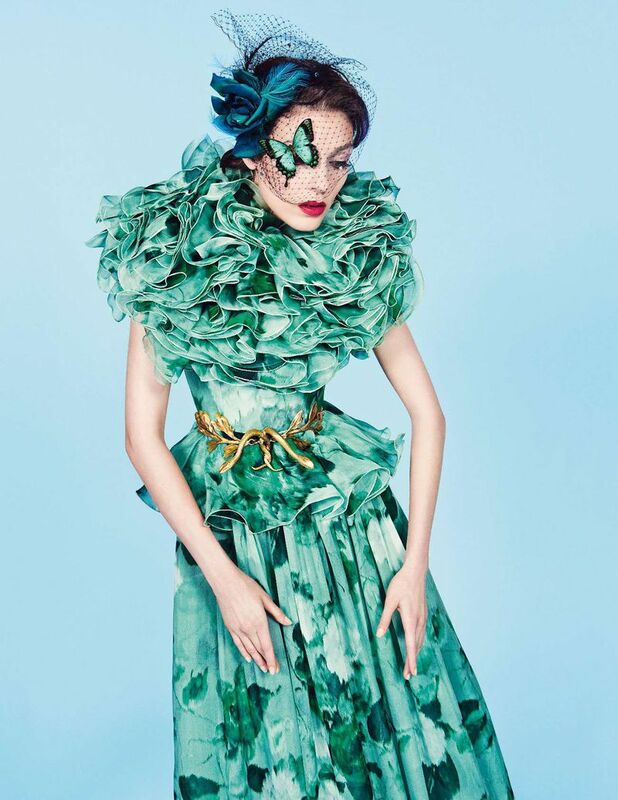 Emerald green is all the rage lately! It is a gorgeous and elegant color, isn't it!?! 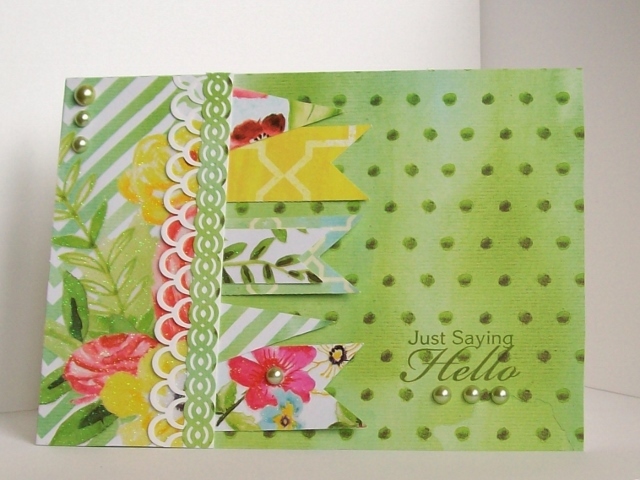 This week in the Moxie Fab World, we are playing with emerald green for the Tuesday Trigger challenge. 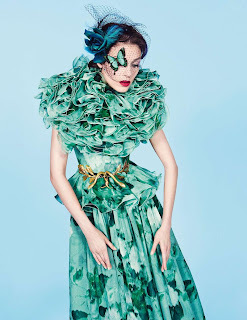 I found this wonderful emerald green butterfly in the Paper Studio's Rue de Fleur collection. It's perfect for this challenge, don't you think. The subtle sheet-music in the background is so fitting for the sentiment from Fiskars. I hope you are having a fun weekend! Thanks for spending a few minutes here. It's always nice to have you dropping in. 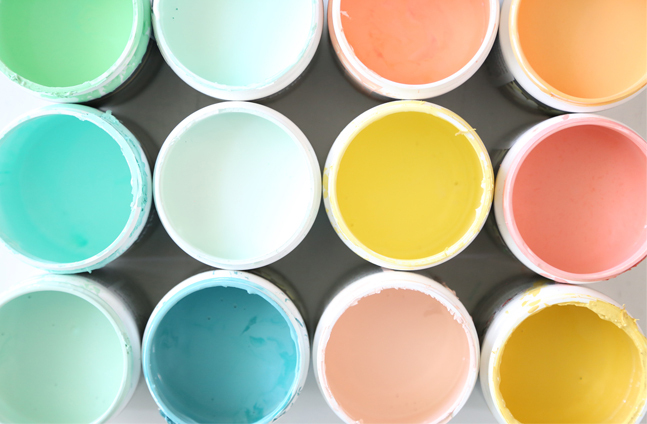 It's time for another challenge at CAS-ual Fridays and this time the focus is on color blocking. I trimmed a white card base into the shape of an egg and color blocked it for Easter. It does stand on its own -- on its side. I thought about trimming the end to make it stand upright, but I really liked seeing the whole egg. I cut strips of colored cardstock trimming the edges with various edge cutters in my collection. I punched the Happy Easter letters and arranged them in a freestyle manner to keep with the nature of the egg. I added a butterfly with 'diamonds' to add some depth and movement. Hope you are having a good day while you are out and about on the web. 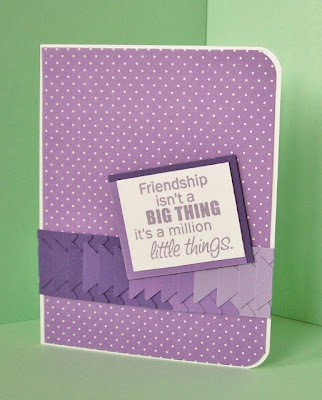 I have a card for you today that I made for the Tuesday Trigger Challenge in the Moxie Fab World. I love the inspiration photo (below) Cath provided this time. It's gorgeous! 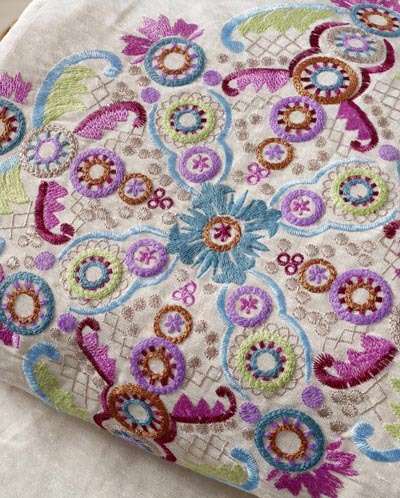 I was really drawn to the embroidered circles. And, those colors - so very Moxie! I picked out a light purple that matches one of the circles and the center teal-y blue to go with it. To give my circles some demension like in the photo, I made fan-fold flowers. Before folding the bigger purple flower, I ran a teal-y marker down the strip giving the look of embroidery. Oh, I should have made a wavy line! Wouldn't that have been so very Moxie!?! Too late now- maybe next time. To give some balance to the card, I ran one score line down the left side of the front. Then, I ran several scores, each one longer the the previous, down the right side of the card. I slipped a heart punched with Fiskars That's Amore punch under each flower letting it just peak out to begin the stems. I made the leaves with the same heart punch by snipping each heart in half. 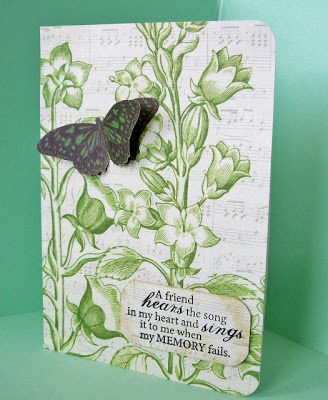 I stamped my Hero Art sentiment (CL342 )with ColorBox chalk in wisteria on a tag. I ran the edges of the tag across ColorBox chalk in arctic deep. I did not intend to make a tag but instead to stamp directly on the card, but I messed it up. I was so mad at myself! I was not about to start over so I added a tag. Looks okay, but would have been better without the mess up. I don't know why I am telling you all this. Thanks for stopping in! Hope you are having a fun day. 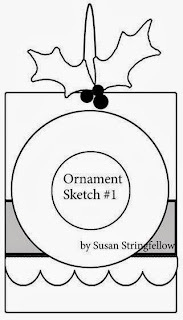 Today, I have a card for DCWV's February Card Sketch Challenge. I used DCWV's The Painted Petals Stack to make this card. I just love the colors in the stack like these beautiful watercolored teals and purples - a kind of boysenberry. Actually, I used ColorBox's boysenberry pigment, which matches perfectly, to heat emboss the sentiment. And, don't you just love the sentiment!?! It's from Fiskars' Friends Forever Quotes collection. 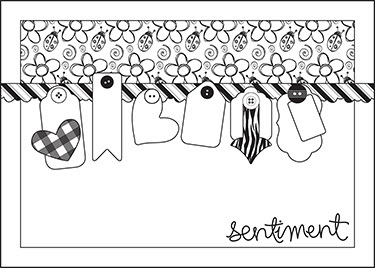 I love the vertical and horizontal strips in this month's sketch. The sketch gave us lots of room to play around and make it our own. To begin, I picked one of the lighter shades of the watercolored stock and trimmed it to fit my card base. I heat-embossed the sentiment on the panel then cut various size and shaped strips from coordinating sheets from the stack and adhered them to the panel. I punched a few fronds (Martha Stewart) and added pearls and flowers. Then, I mounted the panel to my card with foam tape. I will be looking forward to seeing your creations! Thanks so much for stopping by! I so enjoy having you pop in and look around. Today, I have a card that I made for CAS-ual Fridays' Love Letters Challenge. We had to make cards using letters - stickers, stamps, die-cuts, etc. I used some rub-on letters and words for my card. I punched a circle through the front of the card letting the punch just go off the edge. I punched two small hearts and glued them to the back of the opening. 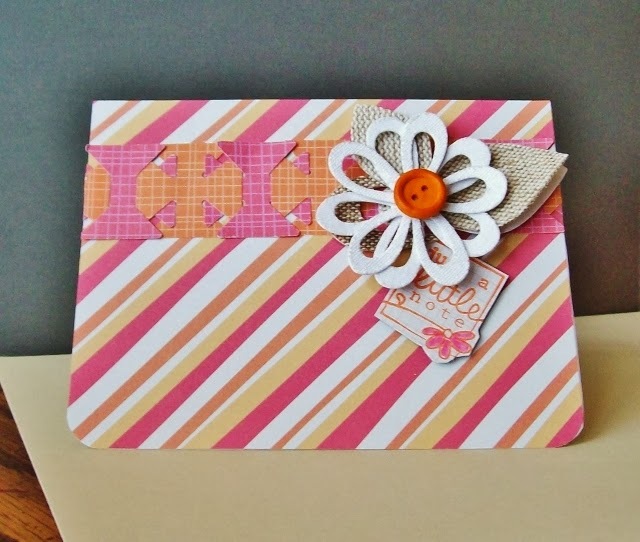 I added a strip of patterned paper on the the inside of the card to show through the opening. Here's a close up of the opening.